This unique graphic novel deserves high praise for direction and purpose. This book is the first in a series of southern Africa history and culture through an exciting storyline complemented with first rate illustrations. The story begins in the late 18th century on the southeast coast of Africa. There it was a time of conflict among local kingdoms. At least one major kingdom systematically attacked its neighbors. The conquest of those neighbors fed the growing international slave trade. After bitter sibling rivalry and exile, one Zulu prince named Shaka stood to resist a growing invasion of the northern slaving clan. Through diplomacy and combat, Shaka collected clans and peoples to halt the invaders. Victory came at a great cost in lives in early defeats and ultimate victory. Victory also included Shaka’s mortal combat with his half-brother, who challenged Shaka’s leadership. The book concludes poised to continue the saga and legend of Shaka as the Zulu nation begins to emerge as a strong unified kingdom that will shape the next centuries of southern African history. This graphic novel has multiple attributes which make it unique. It begins with a concise foreword by a university professor well-versed in the legend of Shaka, a towering historical figure. The introduction takes the reader on the initial steps of a major intellectual journey through the organized and civilized African world pre-dating European colonization. 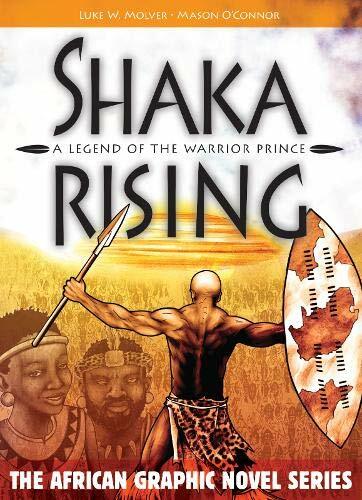 This introduction is careful enough to by both name and illustration to identify the key players in Shaka’s world. These simple acts make a complex history so much the easier to understand and appreciate. The 22 pages of supplementary material following the novel are carefully constructed to compliment it. Dialogue and illustrations zoom in on the story just told. Story panels are expanded to explain the Zulu social and family structure, the paths to clan leadership, belief systems and even the nuances of dress and fashion. These backstories are actually keyed to specific pages of the novel. Thus the additional information is cleverly integrated with the action of the storyline panels. Shaka Rising is a masterful combination of education and entertainment. In just 90 pages, a reader who may have known little of pre-European Africa will easily absorb a nova class burst of information. False myth and suspicion about Africa and its people are immediately replaced with the beginnings of better understanding. Shaka Rising is a groundbreaking graphic novel. It belongs on school and home shelves. And the hope is that the series to follow will be equally professional, educational, and entertaining. Robert Zupkus was a nonfiction reviewer for the American Bar Association's Gavel Awards as well as serving in the Gavel Award selection process.